Some people think hearses in general are creepy. I don’t. But this one is. It’s that ornate, Victorian-like coachwork that makes it look like it should be driven by a ghost in a tuxedo and a top hat. Cunningham built attractive passenger cars from 1911 through 1929. From 1929 through 1936, they concentrated on hearses, ambulances and other car-based commercial vehicles (something they’d been building since practically day one). This car is powered by a 45 horsepower, 7.2-liter V-8. That’s an embarrassing amount of power from such a big engine, considering Duesenberg’s eight-cylinder engine from 1929 was making 265 horses. But who cares, really, because as heavy as this car looks, it’s enough power to cruise at parade speed, which is really the only thing you’re going to do with it unless you own a funeral home and a time machine. 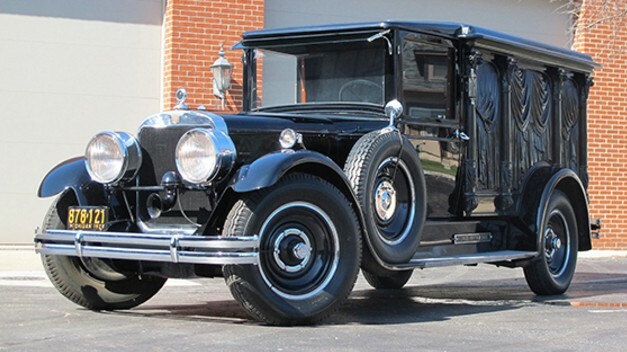 This car comes from a Detroit-area funeral home and before that it was used in Chicago. The wooden carvings on the side are very intricate. It’s an interesting enough automobile that it was on display for a time at the Henry Ford Museum. Only 5,600 Cunninghams were produced over 30 years – so good luck finding another one like this. It should bring between $80,000-$100,000. Click here for more info and here for more from this sale. This entry was posted in Uncategorized and tagged 1929, 33286, auctions, auctions america, cars, classic cars, cunningham, hearse, v-8 by classiccarweekly. Bookmark the permalink.